← Is Hyde Park Walkable? I don’t wish to spend too much time on this blog discussing various underlying precepts, examples, and goals of small streets urbanism, mainly because there are already blogs, including a rather canonical one, doing a great job of that (although Google tells me I am the only person to use the phrase “small streets urbanism,” which I find to be a very natural one). I will endeavor to give links to others’ blog posts whenever possible instead of recreating their arguments myself. Nevertheless, I would like to give my own interpretation of what I mean by small streets urbanism. Let me first define what I mean by “small streets,” since it’s a phrase that can be easily misunderstood. 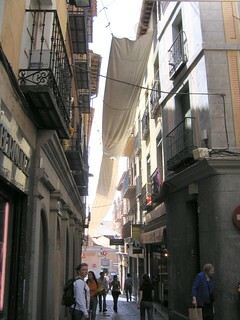 A small streets development is one in which the distance between buildings, measured facade to facade, is small. How small? There is no exact number, although I’ve seen 30 feet thrown around as a good maximum. This leaves precious little room for the extraneous stuff that we have between building facades today: parked cars, green space, separate pedestrian areas, and setbacks. In a small streets design, front doors will more or less open out onto the street. More importantly, I think, is to say what small streets are not. Small streets are not pedestrian-only streets, although they can be, either by fiat or by construction. Small streets are not mutually exclusive with larger arterial roads for motor vehicle traffic, although such arterial roads should be large only in comparison to the smaller streets. And finally, small streets are not necessarily lined by multi-story attached buildings as in traditional cities. Small streets can be populated by single-family detached housing, as in many parts of Tokyo. However, this last point brings us into the “urbanism” part of small streets urbanism. While single-family detached homes are desirable to many, they are also not as dense or as affordable as multi-story attached buildings. So for the South Side, which is broadly low-income, and Hyde Park in particular, which has a large student population, building more single-family detached housing is not really appropriate, even if it does incorporate small streets. So a small streets urban development is one that incorporates multi-story, mixed use, attached buildings in a small streets layout. Such a design enables walkability because it makes walking easier. Walking becomes easier because distances will be shorter, since we have rid ourselves of most of the extraneous space between buildings that I discussed in my last post. Walking becomes safer, because more people will be out walking, and they’ll be doing it in a smaller space, which leads to a much higher density of people out on the streets. And there will be no high-speed traffic to worry about. And keeping the streets walkable in winter will become a painless task, since each individual building will have only a small amount of street space to take care of. While the walkability of a small streets urban space may seem to differ only quantitatively from that of a neighborhood like Hyde Park (a greater density of people, shorter distances, and so on), this can lead to a significantly different way of life. Even when the distance from your place of residence to any individual destination is “walkable,” most of us do not live our lives simply going from our home to a single location and back. We often have numerous errands to run, many of which involve carrying items to or from our homes. Thus, many people drive to the supermarket and pick up a week or two of groceries rather than going to a local produce stand, butcher, fish market, and bakery, even if each of those places is individually within walking distance. It is not that people wouldn’t prefer to do their shopping by walking to such places daily, but the total distance involved is impractical. By bringing everything closer together, such a way of life becomes much more realistic. There is a critical level of closeness required for this sort of walkability that is simply not possible under our current models of urban design. I can imagine that not everybody finds occupied streets more pleasant than unoccupied ones, but I’m sure that I’m far from the only one with this preference. Much of the virtue of living in a city is the opportunity to run into all sorts of people at any moment. Such interactions can only happen when people are brought together. I am an algorithmic trader and occasional writer living in Hyde Park, Chicago. I recently received my PhD in mathematics from the University of Chicago. This entry was posted in Small Streets, Walkability. Bookmark the permalink. I really like the link about Tokyo. When I was in Japan (which was before I knew much about urbanism, but after I started hating lawns) I noticed that the suburban areas were much more pleasant and in particular that the gardens were much prettier than the typical American one. Now I realize that this is only possible because there is very little space and so the people who tend them have to squeeze as much as possible out of it. Another thing to notice about Japan, though, which does not play into the narrative (although maybe it does, because it’s easier to keep small spaces clean), is that it’s bizarrely immaculate, at least in non-decaying urban areas. (In a country with a shrinking population and an emptying countryside, of course there’s also a lot of abandoned junk.) The streets always look freshly paved, the houses new and shiny, etc. This introduces an extra variable into the pleasantness equation — of course you want to live in the neat little house with the neat cypress next to a neat street rather than around that yellowing lawn and fading pavement, regardless of the urban form. The author of that Tokyo post mentions in another post that in Japan, it’s traditional for shopkeepers to maintain the street in front of their building. While it’s unclear how such cultural norms would translate over here, I imagine the prospect of maintaining your storefront is much more palatable when there is not much storefront to maintain! One of the big points he makes in this post (and it’s a post I’ve now linked to twice in comments, so maybe I should mention it more prominently) is that all of the extra space we build into our cities, from lawns and green space to sidewalks and parking lots, takes quite a lot of effort to maintain, and if it’s not maintained, things go downhill fast! That’s the beauty of the traditional city model: when you leave out all of the extraneous space between places, you don’t have to waste effort traveling through that space, and you don’t have to waste effort maintaining that space. Space that people actually use is not burdensome to maintain.